New released of a Springer book with the Proceedings of the 12th International Conference on P2P, Parallel, Grid, Cloud and Internet Computing (3PGCIC-2017) edited by SMARTLEARN members. This book presents the latest, innovative research findings on P2P, Parallel, Grid, Cloud, and Internet Computing. It gathers the Proceedings of the 12th International Conference on P2P, Parallel, Grid, Cloud and Internet Computing, held on November 8–10, 2017 in Barcelona, Spain. These computing technologies have rapidly established themselves as breakthrough paradigms for solving complex problems by enabling the aggregation and sharing of an increasing variety of distributed computational resources at large scale. Grid Computing originated as a paradigm for high-performance computing, offering an alternative to expensive supercomputers through different forms of large-scale distributed computing, while P2P Computing emerged as a new paradigm after client-server and web-based computing and has shown to be useful in the development of social networking, B2B (Business to Business), B2C (Business to Consumer), B2G (Business to Government), B2E (Business to Employee), and so on. Cloud Computing has been defined as a “computing paradigm where the boundaries of computing are determined by economic rationale rather than technical limits”. Cloud computing has quickly been adopted in a broad range of application domains and provides utility computing at large scale. Lastly, Internet Computing is the basis of any large-scale distributed computing paradigm; it has very rapidly developed into a flourishing field with an enormous impact on today’s information societies, serving as a universal platform comprising a large variety of computing forms such as Grid, P2P, Cloud and Mobile computing. 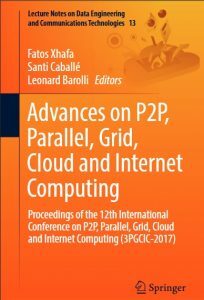 The aim of the book “Advances on P2P, Parallel, Grid, Cloud and Internet Computing” is to provide the latest findings, methods and development techniques from both theoretical and practical perspectives, and to reveal synergies between these large-scale computing paradigms. Xhafa, F. Caballé, S., Barolli, L. (Eds.) (2017). Advances on P2P, Parallel, Grid, Cloud and Internet Computing. Lecture Notes on Data Engineering and Communications Technologies. Volume 13. 889 pp. Cham, Switzerland: Springer. ISBN 978-3-319-69834-2.